HEAVY EQUIPMENT PARTS TO KEEP YOU RUNNING 24/7. Western States Equipment Company is built to keep you running. That’s why we sell Caterpillar and FleetPride parts. We proudly provide easy access to the parts that keep your equipment running and, with over 130,000 on hand and quick access to over 800,000 parts at our central warehouse, there is a good chance that, if you need it, it’s already in inventory and can be picked up at our store or delivered to you. Why Caterpillar and FleetPride? We want to take care of all your equipment needs, whether Cat or competitive brand. Adding FleetPride was all about you gaining access to a wider variety of parts. We know that sometimes equipment repair and maintenance are all about selection and we are proud to provide you with plenty. For additional information, check out Parts.Cat.Com or walk up to any one of our 14 Parts Counters. If you regularly work with or around heavy equipment, chances are, your job is tough. It might be dangerous, too. Construction laborers and truck drivers are two of the top three most dangerous jobs in the United States, next to farmers and ranchers. Also, working in labor-intensive industries can be mentally tiring, with deadlines to meet and clients to please. So what happens when a piece of equipment malfunctions or stops working altogether? Work gets backed up, and workers get stressed out. The pressure to get things up and running again builds to a near-explosion. If you find yourself in this situation, take a deep breath. Here at Western States Equipment Company, you’re in good hands. We’ll get things going again in no time. At Western States, we equip you with quality products only. That’s why we sell Cat® and FleetPride® parts. No need to worry if we’ll have the exact part you need. We have more than 130,000 heavy equipment parts on hand, and 800,000 parts at our central location. If you need it, chances are, we’ve got it. You can pick it up at our store, or we’ll gladly deliver it to you. Why Caterpillar® and FleetPride? We want to take care of your equipment needs, whether that means we use Cat or a competitive brand. FleetPride has allowed us to expand our selection and give you greater access to a variety of parts. We understand how frustrating it can be to not find the right part, so we’ve made a quality selection our top priority. If you’re searching for new or used heavy equipment parts, you’ve come to the right place. Keep reading to learn about the benefits of Caterpillar and FleetPride, and how we can help you get over the equipment-repair hurdle. Caterpillar is the leading manufacturer of construction equipment. You can expect nothing short of high-quality, resilient and efficient equipment when you use Cat. Western States Equipment is an authorized Cat dealer covering Idaho, northeast Oregon, southeast Washington, western Montana and Jackson, Wyo., and we are proud to deliver you Cat-brand equipment. Caterpillar has been around for more than 90 years, and we are pleased to share their nearly century-long expertise with you. After that much time and experience, Caterpillar knows their stuff, and it shows in the quality of their products. When you’re looking for Caterpillar heavy equipment parts for sale, look no further than Western States. Whether you need equipment for construction, forestry or waste management, we’ll get you the tools to be productive and continue to earn money doing work that deserves respect. With free delivery, fast service and convenient locations, we’ll get your Cat parts delivered in a flash. Did we mention we offer great deals, too? Caterpillar believes in progress toward sustainability. From 2006 to 2016, Caterpillar saw a 17 percent reduction in absolute energy consumption and a 29 percent reduction in greenhouse gas emissions. Caterpillar invested $36.8 million in 2016, and put 53 percent of that money toward health and human services. So not only will you be helping your heavy equipment by using Cat products, you’ll be contributing to the environment. Not bad, right? High-quality has to mean outrageous costs, though, doesn’t it? Could it be cheaper to buy a new piece of equipment? Probably not. Our used parts are like-new without brand-new prices. We’ll help you find the best Cat deals and save you the trouble and expense of searching elsewhere, or even making the mistake of buying new equipment when it may not be necessary. Heavy equipment deserves only the highest-quality parts and maintenance to ensure safety while getting jobs done fast and right. Saving time saves money. Caterpillar lets you do both, while making safety a priority too. We’ll help your business continue to meets its goals by getting you the right parts with speed and convenience. Our knowledge and fast delivery will help prevent unnecessary expenses. With Cat products, you always know what to expect. Imagine — you turn the key in the ignition and hear nothing but silence. Suddenly, a normal day fills with panic. You try to jump the battery in hopes of hearing the engine purring, but nothing happens. Time ticks away, and you wonder how you’ll get to work. You might ask: What could be the problem? How much will it cost and how much time will it take? What if the part I need is not available anywhere nearby? Mechanical and electrical issues with vehicles and equipment can lead to an extremely frustrating experience, especially when time and money are on the line. By selling FleetPride parts, we offer a greater selection to suit your needs and remove the hassle out of repairs. We want to give you easy access to not just heavy equipment parts, but to trucks and trailer parts, too. By covering all these areas with FleetPride and Cat parts, there’s a good chance we have what you need when you need it. FleetPride parts will help you stay within budget, without sacrificing quality. Since 1999, FleetPride has been one of the largest distributors of heavy-duty truck and trailer parts in the U.S. FleetPride cares about delivering quality to their customers and will tailor their service to meet your needs. We take pride in working with FleetPride! All transmissions have been dynamometer tested. Every unit has new key parts. Stay within budget while meeting your needs. FleetPride serves customers of multiple industries, from freight and shipping to construction and waste management. By delivering you FleetPride parts, we make heavy-duty repair easy. Contact us at one of our 12 convenient locations, and we’ll work to get you back on the road or worksite in no time. We’re happy to help. Because we carry Cat and FleetPride parts, we can handle just about any challenge. With Western States, you won’t have to rack up costs searching far and wide for the right parts and services. There’s no need to look elsewhere — we’ll take care of the legwork for you so you can have more time to take care of business. Think of the time it takes to drop what you’re doing so you can run to the nearest heavy equipment parts shop, and then back to work. Your workers or co-workers might have to stop what they’re doing, too, just to wait for you to return. Even if you only need to replace a lightbulb, you’ll soon find you’ve already spent more than an hour driving back and forth. Between traffic and waiting in line behind other customers, you were gone for a lot longer than you expected. You could have spent all that time you wasted just to pick up a lightbulb in a million more productive, money-making ways. You’ll never get that time back now. Sometimes, getting a part can take even longer than an hour or two. At Western States, we want to help you avoid that hassle altogether. Want to know the biggest plus to our delivery service? It’s free. We’re already stocked with the most in-demand parts to ensure the fastest possible delivery. If we don’t have a part, our centrally located warehouse will, and we’ll get it to you within 24 hours. Our professional parts consultants are available to assist you with any questions or concerns you might have, making the process even smoother. With more than 100 reliable and responsive field service trucks, we can deliver parts and make repairs, whether you’re at the worksite or stranded on the road. Our goal is to do whatever it takes to save you time, money and trouble and get you up and running fast. Need a delivery to Spokane? Lewiston? Missoula? Just as we cover a variety of industries, we deliver to a wide range of locations in the Northwest. Maintaining or repairing your heavy equipment does not have to be a time-consuming task. Between our trained technicians and our professional parts consultants, we have the expert knowledge to efficiently solve problems. If you need help installing parts or maintaining your equipment, don’t hesitate to reach out to us. We offer field and emergency services 24 hours a day, seven days a week. We have more than 350 professional technicians who are ready to quickly troubleshoot, diagnose and repair any of your heavy equipment dilemmas. Our parts consultants are available at every location across five states. They are trained professionals who are prepared to assist you and answer your questions with expertise. We value reducing stress levels for you and your workers, because we understand how stress diminishes productivity. Our expert team of technicians and professional parts consultants helps improve overall productivity because they make the entire process a seamless experience from start to finish. As a result, you’ll have a lot fewer workers wanting to shout, because they’ll have the tools they need to get their job done without interruption. Want to order your parts online? We make that easy, too. You can order Cat parts fast from your computer or phone through our Parts.Cat.com platform. Signup is quick, simple and free, and allows you the convenience of ordering Caterpillar parts from work, home or any location. Through Parts.Cat.com, you’ll have access to more than 1.4 million Cat parts, 24 hours a day, any day of the week. This mobile-friendly platform allows you to check pricing and availability, and have parts delivered to any location. With Parts.Cat.com, you can get straight to the part you need in a single, effortless transaction. Maintaining your equipment and using quality parts is extremely important for a variety of reasons. For one, heavy equipment is costly. If you don’t maintain your equipment or make repairs when needed, you might find yourself searching the market for new machinery. This can put a strain on your finances, so you’ll want to do everything you can to prevent damaging equipment beyond repair. You want to make sure your equipment meets safety standards, too. Low-quality, damaged or defective parts can lead to serious injury or even death. There have been cases where brakes have failed and seats malfunctioned, causing serious accidents. Making sure your equipment is in excellent condition saves you money in the end and protects you and your workers from harm. Inspect equipment before starting work, and report any defects or malfunctions. Keep lights in working condition. You use heavy equipment under all kinds of weather conditions, so it doesn’t take long for equipment to get covered in mud and dirt. The natural elements can really put wear and tear on a piece of machinery, so make sure you clean it well from time to time. Consider hiring a professional power washing team to give your equipment a good wash.
With proper maintenance, you’ll help preserve your heavy equipment’s value, saving you tons of money in the long-run. If you use high-quality parts, you’ll be less likely to see parts fail, and you’ll spend less time in the shop. Ultimately, your best bet is to go with equipment that is built to last and has a reputation to prove it. Above all else, the safety of you and your workers matters most. We are here to make sure your equipment is in excellent condition to help you and workers stay safe while working hard. Sometimes, parts don’t work out. Maybe it’s the wrong part, or maybe you don’t need the part after all. It’s OK if this happens. We’ll take the parts back, credit your account and gladly assist you with any questions. Please have your invoice handy when you make a return, and make sure the part is in sellable condition. We want to help you get the most out of your return, so please refer to our parts return policy for all the details. Ready to order a new or used part for your heavy equipment? 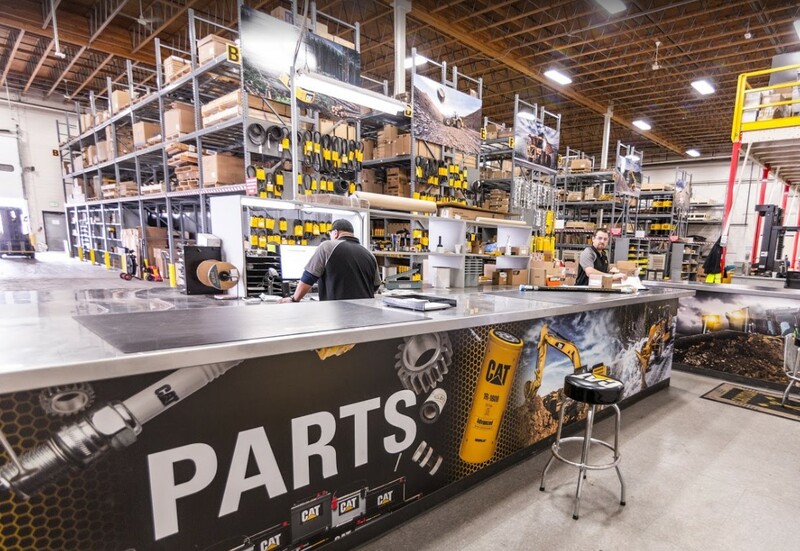 Our professional parts consultants are ready to help make your shopping experience easy and convenient. Contact Western States Equipment Company today!